LOL, yes this make only one serving! NOOOOT. But you will want to make it one! Creamy and yummy! Place ingredients in large bowl. Mix with knives, then hands. Mixture will be crumbly like pie dough. When well mixed, take large handfuls and knead. Pinch off small amount and roll into small balls. Place on waxed paper on cookie sheet. Chip or grate Para-Wax into chocolate chips and melt in double boiler. Remove from stove or leave on low heat. Stick toothpick in ball & dip each ball leaving small area around pick free of dip. Place on waxed paper on cookie sheet & refrigerate. MAKES 6 LBS. OF BUCKEYES! Omg, just pass that sundae right through the screen, please! I have my spoon ready! Great recipe!! The dessert is just a simple sunday. 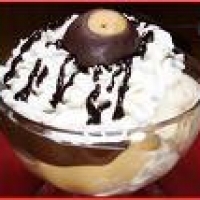 Peanut butter ice cream, with fudge topping and cream and using a buckeye for a garnish. But you didn't tell us how you did the pretty dessert in the bowl. YUMMIE looking. 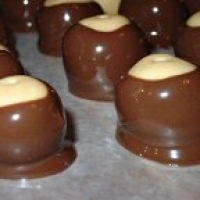 I make Buckeyes, there wonderful. Good post. I want some of these. 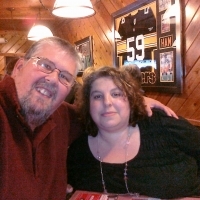 They look so good.